When it comes to coffee, I enjoy my Bibo Coffee. The other thing I enjoy just as much is dressing up my coffee cups with a cute sleeve. I try to coordinate them with the season or an upcoming holiday – I made one for Christmas and a couple for Valentine’s Day. So of course, I had to make one for Saint Patrick’s Day. All of my sleeves start off with simple rows of half double crochet stitches worked in the round with increases every other row. Despite making several sleeves, I still need to adjust the stitch count a bit since they end up being a bit big every time. Once I have a ‘pattern’ that works, though, I promise to share it as a free pattern. In the meantime, I’ll refer you over to All About Ami’s coffee sleeve pattern. To make the shamrock, I used Skip to My Lou’s pattern. I had to use less stitches on the stem so that the entire shamrock would fit on the sleeve. 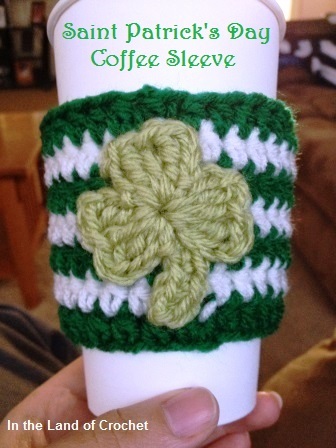 For the coffee sleeve, I used Red Heart Super Saver yarns in Paddy Green and Soft White. For the shamrock, I used Vanna’s Choice Baby yarn in Sweet Pea. Because coffee sleeves work up so fast, you’ll be able to make one just in time to enjoy on March 17th. To make sure you get notifications of new posts, including an upcoming one with the basic coffee sleeve pattern I’ve promised, sign up using the ‘Follow’ option on the right hand bar.